Swales are the broad, shallow channels along roads, driveways and parking lots that are designed to keep water off your road. They are a key part of the City's stormwater drainage system. Properly maintained swales can collect stormwater runoff, trap pollutants, increase groundwater recharge, and slow the flow of runoff – thus reducing erosion. Palm Coast has more than 1,200 miles of roadside swales. The importance of performing regular swale maintenance cannot be understated. It is extremely important for property and home owners to continue regular swale maintenance to minimize flooding. Do not have roof drains running onto the driveway or into the right of way. The City performs ongoing swale maintenance to re-grade miles of swales each year. The goal is to sustain the City's original swale design so that it functions in the way it was built to perform. Palm Coast has an effective drainage system that is environmentally friendly and has proven itself over time. 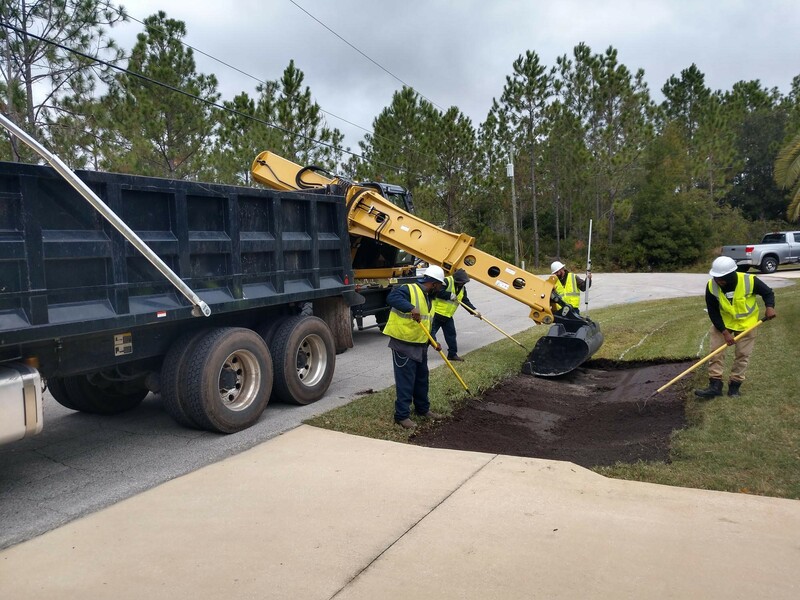 To counteract any issues that may appear, the Palm Coast Public Works Department performs ongoing maintenance to keep swales operating properly. Q. Why is there standing water in my roadside swale? A.	Swales are designed to capture stormwater runoff, direct runoff, maintain a dry roadbed and store runoff. So, it is normal to have standing water in your roadside swale. Continue reading for more details. Q. Should a swale fill up with water during a rain event? A. It is not unusual for your swale to fill up with water during a rainfall. It may take 3-7 days after a rain event for your swale to return to its normal condition. It may appear that the swale is not functioning when holding water, but percolation is actually happening at the bottom of the swale. If your swale holds a little water and then the water goes away after a few days AND the grass in your swale is healthy, it’s working as intended. However, some swales are classified as wet swales, meaning that the water table is above the bottom of your swale and the swale will never be dry. Even when neighboring swales are dry, your swale may retain water due to a perched water table. This is normal for a wet swale. Q. What should I do if I think my swale has a problem? A. 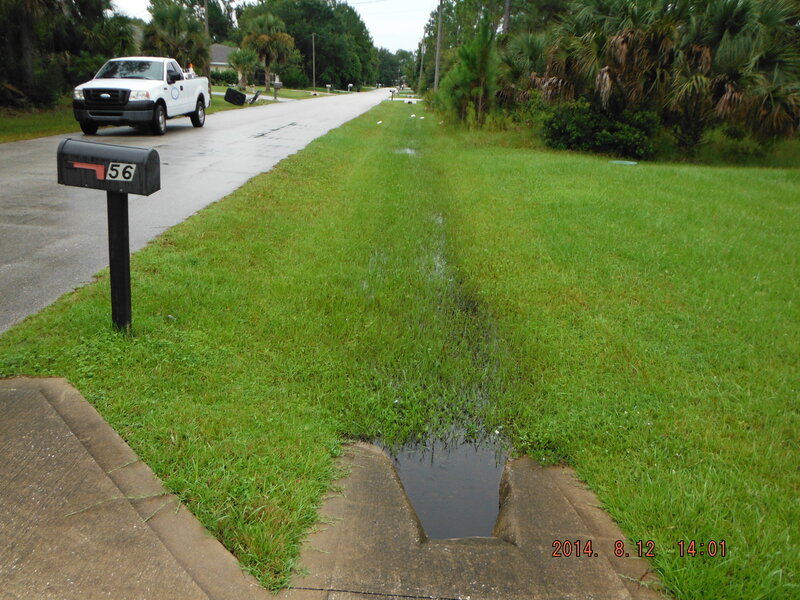 If your swale is more than 50 percent higher than the bottom of your driveway culvert pipe, or if you have excessive amounts of standing water in your swale (for example: 8-12 inches of standing water for more than a month), please email customer-service@palmcoastgov.com or call Customer Service at 386-986-2360 from 8 a.m. to 5 p.m. Monday – Friday. The City will conduct an inspection to determine whether any maintenance or corrective actions are needed. Q. If it’s raining and my swale is filling up, what should I do? A. Unless water is endangering your dwelling or property, do not call Customer Service during a rainfall. It is to be expected that swales, ditches and roads may fill with water during a heavy rainstorms. Allow time for them to drain (a few hours for a roadbed; 3-7 days typically for a swale) before determining whether to contact Customer Service. Q. Are homeowners ever permitted to fill in their swales or put in pipes so the yard can be extended? A. Swales are key to the City’s stormwater drainage system and must not be paved or filled in with dirt, sod or landscaping projects. Swales run from property to property, creating a stream that flows first to the inter-connecting ditch system then to the freshwater and saltwater canal systems and larger bodies of water. Blockages can keep the system from progressing. Q. Years ago there was not as much water in the swales. Why is there more now? A. A major reason is development. As lots are developed, natural areas that were used for holding water are filled in and homes, patios and driveways that were built on previously vacant properties create impervious surfaces that create additional runoff. It’s important for all homeowners to properly maintain their swales to ensure the entire system is operating at the highest level. Q. What if my driveway culvert is blocked or damaged and water will not drain? See above for additional swale maintenance tips. Q. Do swales reduce road flooding? A. During normal rains, one of the swales’ major functions is to maintain a dry roadbed. The bottom of the swale is generally a foot or so below the road and helps keep the road above the water table, thus maintain the structural integrity of the road helping it to last longer. Q. Why does the City dig out my swale and replace the grass? A. Understand that sometimes swales must be dug out or regraded in order to re-establish their shape – this allows swales to continue to do their job. The City also has an extensive program to maintain ditches and canals, replace pipes and provide other improvements to keep the overall stormwater drainage system operating efficiently.